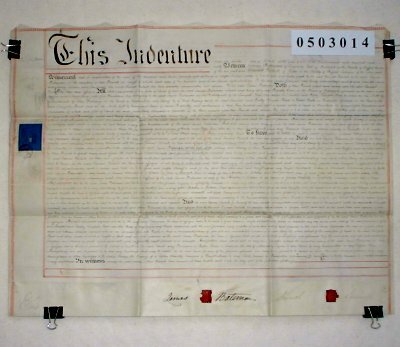 Parchment : 1 sheet 51cm x 66cm with 2 wax seals, revenue stamp, and a small plan of the property on the back. James Bateman is selling property in Biddulph to Samuel Carlisle for £112 8 shillings. It is a plot of land of 418 sq.yds marked and set out as building land bounded on the East by the Tunstall and Bosley turnpike and on the South West by the road to Gillow Heath.